On and on, he went. Till he approached the opening. One last stride and he was out into a vast landscape, where a blue river flowed calmly across a green expanse. Far away in the distance, he could see the violet mountains with glaciers glistening in the sun light. And the water in the river sparkled with light too. On the banks of the river, poplars and alder trees formed small enclaves, like friends gathering in circles. One or two grey houses dotted the landscape at mid-bank, while a heron moved slowly on the left bank, as if it were an old thinking man. High above, a bald eagle circled in the sky, as if delivering a hidden message. Merlin was delighted. He chose to walk on the left bank. As he walked, he lost track of time, since the day was clear and the sun was steady in the sky. Yet, it was pleasant and cool. Merlin walked and walked, taking in the warmth and the gentle sun rays on his skin. After passing the last house, he headed towards a conspicuous group of trees. He had always felt peace and emotion among trees. It looked like a grove. He slowed down and went inside the sacred circle of trees with reverence. There was a large flat stone on two dolmens. It looked like an altar. Just next to it, there was a most peculiar tree: in the middle of that luscious greenery, it was barren and naked. Only a few, small leaves hung there. Merlin marvelled at that sight. Then, he closed his eyes and prayed that he might understand. Gradually, the sky was covered with clouds and the grove grew dim and shadowy. Merlin kept his eyes closed for an indefinite time, although he could sense the light passing away. When he came back from that suspended state, it was twilight. The air was filled with a violet afterglow. 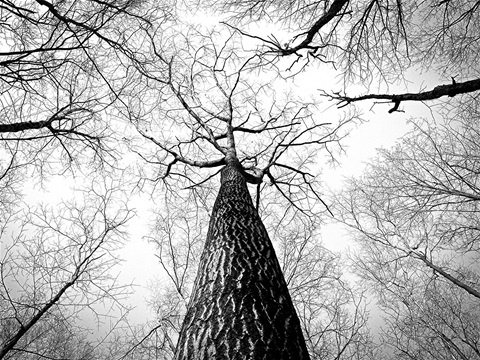 He looked at the barren tree and saw its small leaves grow in size on the branches. Buds grew and opened. They bloomed. Merlin expected to see fruits any time now, but soon odd and different objects hung from the branches, instead of apples or pears. Merlin closed his eyes again. Then he re-opened them. The strange objects were still hanging there.